On a cold night floating on the Thames, Charles Marlow regales his shipmates with the tale of his encounter with Kurtz. This was a man with what many saw as natural greatness, yet on an ivory expedition in Africa he was swept up in corruption and madness. 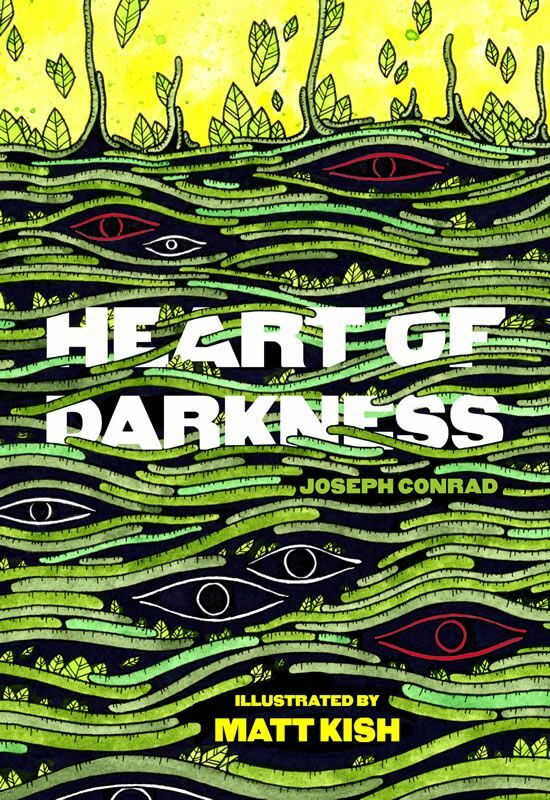 There are (likely unintentional) echoes of Melville in the heightened language and mangy characters, but where Melville used his beautiful prose to elevate you to the skies, Conrad pushes your face into the dirt. His descriptions of Africa and the long river the characters journey down are so vivid that, much like in The Drowned World by Ballard, heat seems to radiate from the pages. It’s almost enough to make you sweat. There’s also an impressive tension which permeates the book; while the description of Africa itself is a twisted caricature of the continent, often veering into colonialist wet-dream, cutting dialogue and a constant sense of danger means that character interactions are always fascinating. The very last section, which isn’t even set in Africa, is the most interesting. This may be because Conrad is far more engaging when he’s writing about people in general rather than specific individuals, as with the latter his tendency for caricature again shows its head (although Kurtz is an exception). During a scene with Kurtz’s wife, it becomes obvious Marlow will live a life contaminated by the darkness both he and Kurtz immersed themselves in when they went into a foreign land with little sense of danger. Marlow went to Africa just to travel along a snakelike river, but the serpent bit him and the poison will never leave his blood. He saw the continent, and the people inside of it, as something incidental to his own personal journey, and was punished for his naïveté. Conrad makes it clear that corruption and violence never quite leave those who encounter it. The taint will always be in the back of the mind, whispering. William Stoner is a university professor with little ambition who walks through the world as though bracing against a strong and cutting wind. When he sits at a desk, it is too small for him; when he puts on clothes, the cuffs are too tight; after marriage, he discovers his wife is as bad a fit as most everything else in his life. His life is a slow, quiet trudge through ill ease. This is a novel which is sad and tender, moving you over an emotional cliff face with a gentle touch and then watching you fall with pity. It’s odd then that it’s such a joy to read. Williams has the gift of being incredibly erudite without excluding readers. There are few allusions to outside texts (or at least ones the reader needs to know to understand), and the language rarely uses in obscure words or references. Instead, word choices are so meticulous, and each sentence flows into the next with such delicacy, that this is writing which is simply awe inspiring. William Stoner is big-hearted in the meek Midwestern way, and thus intensely loveable, so the attachment I and so many other readers have formed with him shouldn’t be a surprise. Yet it’s unusual for a protagonist to be so passive, and strange how the petty acts of cruelty against him made me angrier than acts of pure evil in other novels. His timidity pushes a theme of isolation and endurance in a cruel world, and this may be what makes small moments all the more affecting. Other characters are created and carefully cast aside by the author, but never forgotten by the reader. Dave Masters, for example, appears for maybe ten pages at a stretch yet has lodged himself more firmly in my mind than the protagonists from many other novels. So this book is hardly plot heavy and has none of the hallmarks of what could be considered a page-turner, yet I didn’t want to stop reading. It gives you with the kind of warmth William Stoner longs for in literature and which makes me grateful as a reader, and so now I’ve finished I’ve already ordered another John Williams novel to light the same sort of fire in my chest. Robert Kerans lives in a haze. Heat and self-imposed isolation have his brain turning on itself, twisting into patterns foreign to modern civilisation. London seems to be going backwards in time, becoming engulfed by lizards and enormous plant-life. A world which he is too young to remember is being eaten by a world he is eons too late for. One of the things that intrigued me about The Drowned World was that if it came out now, its basic premise could cause it to be dismissed by as an on-the-nose and melodramatic eco-parable. Yet here it is, a climate change novel from more than fifty years ago. He had the freedom to go full-throttle about a topic many modern fiction writers would never touch with this sense of inventiveness for fear of seeming insensitive. Ballard’s prose is evocative of eras long past, lagoons and heat and reptiles, and the post-apocalypse he’s created is an intriguing one. It’s more of a world long forgotten than one created by, say, nuclear war. This novel is, however, a product of its time, for both good and bad. There’s an interesting way in which the fading world acts as a stand in for the British empire: good. The only female character is paper-thin: bad. There’s fascinating conjecture on evolution and the primal nature of humanity: very good! It’s at times painfully colonial, bordering on racist: very, very bad. It’s also painfully uneven. The first half dry, uneventful but occasionally fascinating hard sci-fi. The second half is some sort of absurd and pre-Lynchian fever dream, which an incredibly powerful ending that has some of the best imagery I’ve read this year. If you can grit your teeth and make it through the bumps in the road, the final pages will justify the time you spent with Ballard here. The next time you’re cold, pick up The Drowned World. It’s an intense experience which will evoke both heat and an age best buried and leave you glad when there’s snow still falling.